I recieved the Bicycle- Shaped Bottle opener! 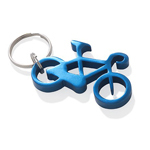 I recieved a Bicycle Bottle opener keychain for review. These keychains are $6.99. My review~ Very well made. The color stands out very well and is a nice color. Bottle opener portion works great. Wholesale key chains has a wide variety of keychains avail! They offer Flashlight LED Keychain, Laser Pointer Keychain, Pepper Spray Keychain and many more!